(13 %) = $123.17 Breakfast included. 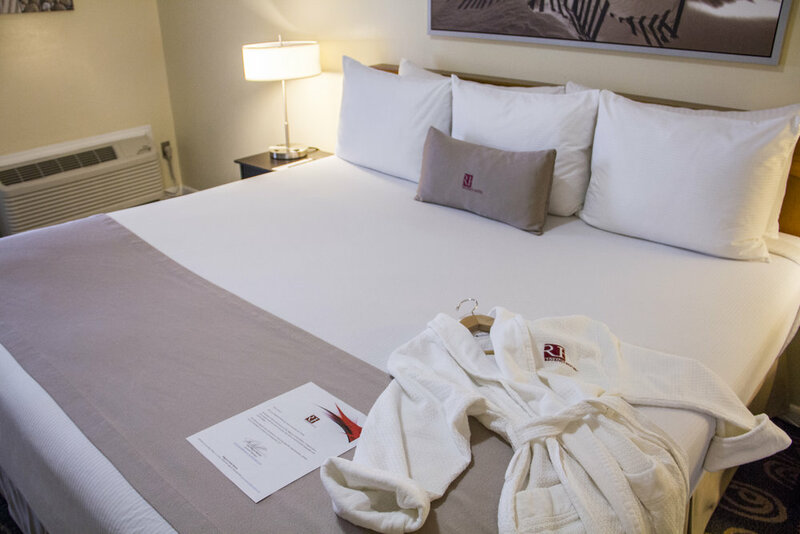 With a distinctive boutique ambiance, the Regency Hotel is a leading choice amongst Miami hotels. Our personalized service, attention to detail, and independent mind set differentiate us from our competitors. Our multi-lingual staff is available 24 hours a day to handle your individual requests and make sure you can take full advantage of our wide range of services and amenities. Transportation: Complimentary shuttle transportation is provided to and from the Miami International Airport from 5:00am - midnight. Shuttle service is also available to the Dolphin Mall for just $10 per person round trip. Daily one way shuttle to the Port of Miami is available for $10 per person. Restaurant: Our Prieto's restaurant is open for breakfast from 6.00 am - 9.00 am. Lunch and dinner is also served daily at our Lounge from 12.00 pm to midnight. Regency Buffet breakfast is included for two people in the room. Other: Spacious rooms with a spectacular pool or city view. Our hotel is conveniently located just 15 minutes from the blue skies and turquoise waters of Miami Beach and South Beach.